(Left to right on top) Kyle McLeod, Darrh Bullock and Surendranath Suman. (Bottom) Richard Coffey, Donna Amaral-Phillips and Morgan Pyles. 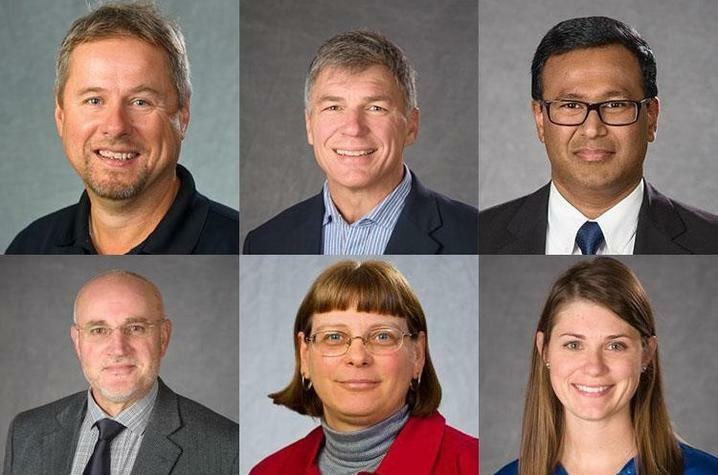 LEXINGTON, Ky. (Aug. 17, 2018) — Several members in the University of Kentucky College of Agriculture, Food and Environment Department of Animal and Food Sciences recently brought home national awards. The American Society of Animal Science presented the Animal Growth and Development Award to Kyle McLeod, associate professor and a recognized authority in ruminant growth and development. He has published 72 peer-reviewed papers and more than 150 abstracts and research reports. He has generated more than $4.2 million in extramural funding and has given 17 national or international presentations. Professor of meat science in the Department of Animal and Food Sciences, Surendranath Suman, received the ASAS Meat Research Award for his focus on fundamental and applied aspects of meat color. Suman is a pioneering researcher applying state-of-the-art tools to solve protein-based concerns in meat quality. He has published 71 peer-reviewed journal articles, delivered lectures in 13 countries and received many prestigious national and international awards. ASAS also recently named two UK faculty as fellows. Darrh Bullock, UK beef specialist, was named a fellow in the extension category, and Coffey was named a fellow in the administration category. Morgan Pyles, a graduate student advised by professor Laurie Lawrence, received the 2018 Josie Coverdale Equine Scholarship. The award recognizes excellent equine science students. The American Dairy Science Association (ADSA), southern branch, presented UK dairy scientist Donna Amaral-Phillips with its Award of Honor. Also, ADSA recognized several UK dairy students for their accomplishments. Gustavo Mazon received first place in the Graduate Student Division Three-Minute Thesis Competition. Melissa Cantor was elected treasurer of the Graduate Student Affiliate Division. Paige Cecil was elected treasurer of the Student Affiliate Division of ADSA and awarded second place in the ADSA-SAD Undergraduate Dairy Foods Oral Competition. Sarah Mac placed second in the ADSA-SAD Undergraduate Original Research Oral Competition, and Megan Woodrum earned third place in the ADSA-SAD Undergraduate Dairy Production Oral Competition.